Complimentary Tickets for our Multinational members and Patrons. 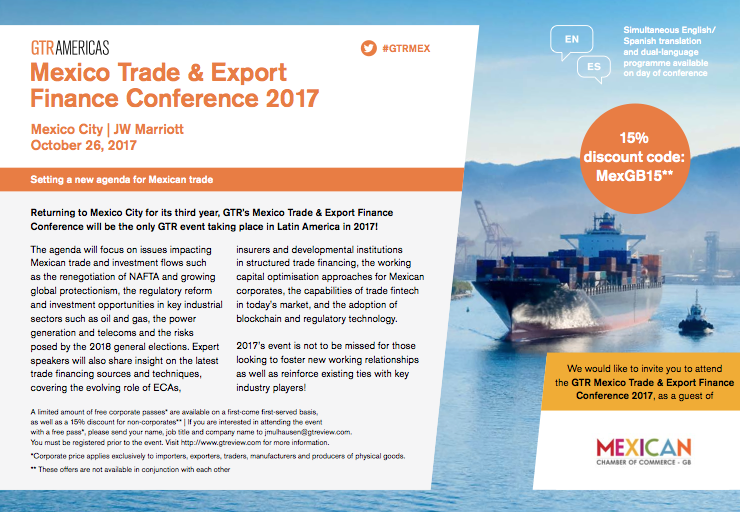 Returning to Mexico City for its third year, GTR’s Mexico Trade & Export Finance Conference will be the only GTR event taking place in Latin America in 2017! 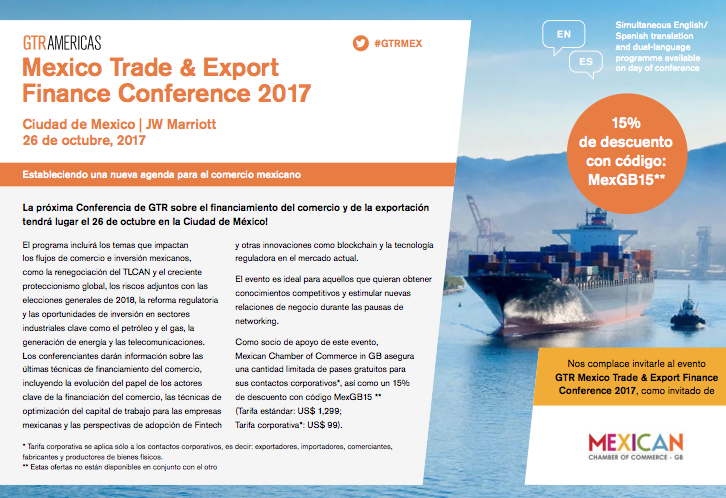 The agenda will focus on issues impacting Mexican trade and investment flows such as the renegotiation of NAFTA and growing global protectionism, the regulatory reform and investment opportunities in key industrial sectors such as oil and gas, the power generation and telecoms and the risks posed by the 2018 general elections. Expert speakers will also share insight on the latest trade financing sources and techniques, covering the evolving role of ECAs, insurers and developmental institutions in structured trade financing, the working capital optimisation approaches for Mexican corporates, the capabilities of trade fintech in today’s market, and the adoption of blockchain and regulatory technology. 2017’s event is not to be missed for those looking to foster new business relationships as well as reinforce existing ties with key industry players!